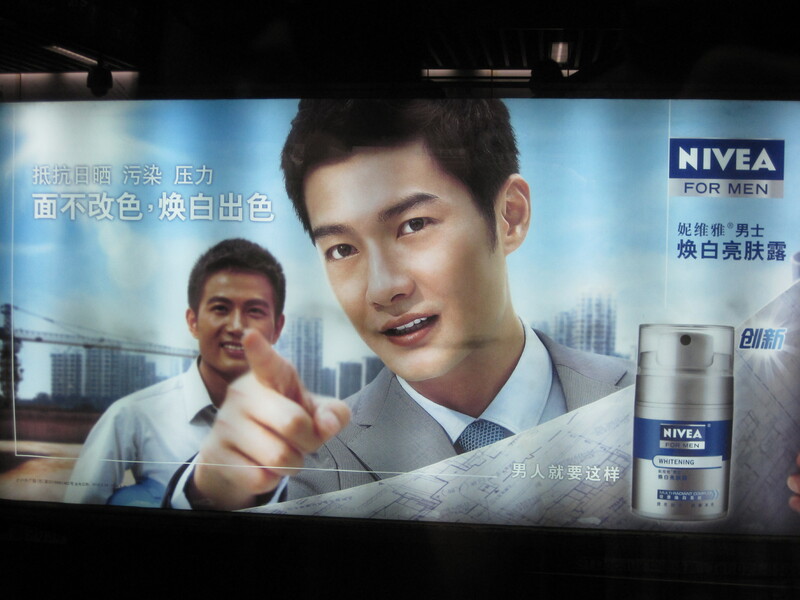 Shanghai: Introducing Nivea Skin-whitening Cream — For Men? What are you looking at, whitey? Skin-whitening cream has been in vogue throughout Asia since cosmetics companies made it cheap and easily accessible. And, I had thought, it was a fad only popular with women. Skin-whitening is quite popular in countries such as Thailand and India because many women feel compelled to ebb the effects of skin-color discrimination handed down by higher castes. Excessive use of the cream has, however, been reported to cause funky side effects or even, as reported by the Guardian, death. Noticing similar social trends in China, Nivea has taken the move to start marketing towards a broad range of demographics. Umbrellas have an uncanny ability to appear on both rainy and sunny days throughout China, but I’ve rarely seen men shading themselves from the sun. Excellent article, i wonder if this would work here in America, especially with stress!!! To My Understanding of Chinese People’s Dermatology, Chinese Peoples genetically have different Complexion tones, from whiter than Whiter Complexion, pale Grey which is pale complexion which isn’t as pale as the Color White, Pink, yellow, light brown, medium brown, Dark Brown and near the Color Black. In Modern City China, Chinese People’s Complexion range from Pale Grey, pink, yellow and even Brown, and City Chinese Peoples do use Skin Products which are whitening and with UVA/UVB Filters from Major Brands. Outdoors in the Cooler Months. 90% of Rural Chinese Women have Skin which looks Whiter than the Color White 40-100 times. 5% of Farmer Chinese Women have Pale Grey, Pink or Yellowish Complexion. And 5% of Farm Chinese Women are Suntanned dark Yellow to Brown. I Hope that this Fact would make More People understand Chinese People’s Dermatology. Umm.. I think I didn’t explain so clearly, I would like to supplement,that all Chinese peoples like all Oriental Peoples genetically have different Complexion tones, from whiter than Whiter Complexion, pale Grey which is pale complexion which isn’t as pale as the Color White, Pink, yellow, light brown, medium brown, Dark Brown and near the Color Black. In the Urban Areas of China, Chinese People physically inherited Pale Grey, pink, yellow and even Brown Complexion, but the City Chinese do Use Skin Lightening Products and UV Filtered Products. But In Rural China, Chinese Women inherited physically Whiter than the Color White Complexion 40-100 times. However Chinese Farmer women avoid Suntanning, by staying away from UV rays in the Warmer times of the year. Rather than using these expensive Skin-Care products where only Wealthy Urban Peoples can Afford. Thanks for your input. You say that “90% of Rural Chinese Women have Skin which looks Whiter than the Color White 40-100 times.” That is an intriguing stat to throw up there. Do you have any sources for that? Also, the way you describe ‘rural’ and ‘urban’ Chinese is like you are discussing two different species. Weren’t most urban Chinese considered rural until recent history? Does that count migrants? Can’t say that I agree with this perspective as I’ve encountered Han Chinese across the rural-urban divide with quite different skin tones. Thank You for being Interested in My Comment. I would like to share some Academic Knowledge, in that You might be interested in knowing about. which looks Whiter than White, White, Grey toned Complexions, Pink Complexion, Yellow toned Complexion, Light & Medium & Dark Brown Complexion and almost the Color Black Complexion. And the Origins of these different Skin Complexions are from very different places of Pacific Asia. All Oriental Peoples finds their Origin from the Arctic Circle, 25,000 – 70,000 years ago, depending on which Oriental group it is. The Ancestors of the Han Chinese and the Ethnic Minority Peoples of Central and South China which are Collectively known as the Sino Tibetan Peoples arrived to Northern China from the Arctic Circle 25,000 – 35,000 years ago. The Sino Tibetan Peoples then expanded Southwards 9000- 7000 years ago. And the Han Chinese expanded South Many milliner after. The Fact is that Many Many 100,000 years ago the South East Asia Indigenous Peoples Navigated to the Polar Region and Inter Married with the Native Peoples of the Arctic Circle, and Combined they became the Early Siberian Peoples. then these Early Siberian Peoples expanded to all of East Asia and South East Asia 25,000- 75,000 years ago. Now the Whiter than Whiter Skin & Hair & Eyes were the Original Pigmentation of the Native Siberians, As Mentioned before the South East Asia Austronesian peoples which Navigated into the Polar region many many 100,000 years ago. The More Northern South East Asia People’s Pigmentation was : Grey/ Pink Complexion and they had Light Blue/Green/Light Brown eyes and Light Golden/Brown/Orange Hair. The Central Austronesian People of South East Asia, had Yellow toned Complexion which came with Dark Brown Hair. because they lived in an warmer part of South East Asia. The South East Asian which lived near the Equator had Light/Medium/Dark Brown and even near the Color Black Complexion with Various tones of Black Hair and Eyes which looked almost Black. Now the Modern Eskimo, Japanese, Korean, Han Chinese, Sino Tibetan Chinese, Taiwan Han Chinese are descended roughly 58-60% Siberian and 40-42% South East Asia Austronesian Peoples Combined together. The Modern Vietnamese / Thai / Philippine and Indonesia Peoples are the Early Siberian Immigrated to South East Asia 40,000- 45,000 years ago, and then they married with the remaining Austronesian peoples of South East Asia. The Ancient Chinese Women Inherited Black Hair, and eyes which looks near the color Black, which are the Genes from the Origin South East Asian Indigenous Peoples. But it came with Whiter than the Color White Skin, Which Originated from the Arctic Circle. In Modern China, Urban Chinese Women have Inherited Black Hair, and eyes which look near the Color Black with Yellow Skin. Or Pale Grey ( Grey is not quite as Pale as the Color White) or Pink Complexion and obviously some City Chinese women are suntanned Brown. But in Modern Rural China, 90% of Chinese Farmer women Aged 18-50 had Inherited Black Hair and Eyes which look near the Color Black, but with Whiter than the Color White 40-100 times Skin Complexion. These Young/ Middle aged women Farms outside in the Autumn/ Winter but in the Summer they worked Indoors, while the Male Members of their Family did all the Farming in the Hotter Months. 5% of Farmer Chinese Women Inherited the same kind of Complexion as the City Chinese Women. And they are generally not Suntanned. But 5% of Farmer Chinese Women aged 18-50 are Suntanned Dark yellow/ Light/Medium/Dark Brown Complexion. I think this % must be from the poorest of poor Areas of Rural China, where they needed to work harder. So this is the Explanation of why Rural Chinese Peoples have Startingly Different Complexion to the Cities of China. Thank You for Your time. And I hope My Comment and Explanation is Helpful ! !